Francisco Illarramendi, the Venezuelan businessman whose unlicensed hedge funds turned into a $723m Ponzi scheme, for which he was sentenced to thirteen years in Federal Prison, is seeking to be released on bond. He alleges that he cannot adequately review the Government's 800 documents that prove up the losses of his victims, while confined in a correctional facility. The US Attorney's Office opposes his motion, asserting that it is merely a ploy to be released while his appeal, which most observers would probably judge is without any merit, is pending. Illarramendi's pre-trial conduct is one of the worst I have ever seen; his bond was revoked by the Court in 2013, for valid reasons, and he stalled his sentencing for four years, while he changed lawyers, and alleged that he could not ascertain the precise amount of victim loss. If released pending his appeal, he could instruct his counsel to delay the proceedings, for months, or even years, and justice delayed is justice denied. He is also a flight risk, with knowledge of the methods used to secrete funds in Caribbean tax havens, where he sent bribes. He may have funds available to him in the offshore financial centers where he moved money. This Ponzi schemer took out $25m for himself, to justify a lavish lifestyle, while covering up a huge loss in his hedge fund for years. He needs to serve out his sentence, and to stop arguing that the accurate calculation of actual losses requires that he be released to research the documents and files. His arguments are as bogus as his hedge funds were. We trust that the Court will agree. 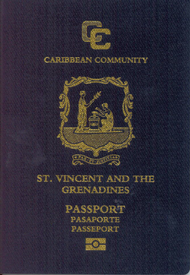 If one of your new bank clients produces a passport issued in St. Vincent & the Grenadines (SVG), check to see his place of birth, and immediately institute enhanced due diligence, for multiple reports of the government's unofficial cash for passports "economic citizenship" program abound. One of Nigeria's billionaire career criminal kingpins bought one, and one must assume, due to the recent Nigerian presence in St. Vincent, that there are others. These are Nigerian Muslims, from the area under Boko Haram control, so there are potential terrorist financing considerations as well. That billionaire criminal owns an airline, complete with five Boeing B-747 airliners; do not underestimate the situation. Additionally, there's a report of an Iranian national buying one for cash, as well as a UK national. Please screen any and all purported St. Vincent nationals very carefully, as they may not be exactly whom they claim to be. Rumors have been circulating, hinting that certain members of the United Nations want to propose to admit Hamas, the Specially Designated Global Terrorist organization, to the UN, as an Observer, with all the privileges that such status brings. 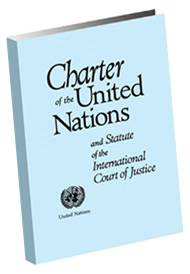 This is absolute madness; the UN Charter specifically states that membership is for "peace-living" nations, and it provides for the suspension, and even expulsion, of any members who violate that cardinal rule. Let me be clear; the time when a sanctioned terrorist group gain admittance to the United Nations, is the time when Western, democratic nations should rethink their financial contributions to that august body. The Hamas charter bluntly calls for the destruction of the State of Israel, and for that reason alone, its representatives are not qualified to sit in the same building as the legitimate members. If Hamas is admitted, will the United States cut off all funding, and ask the UN to relocate to Switzerland ? Yes, I have heard the argument, that Hamas is the de facto ruler in Gaza, and to bring it in to the UN will cause it to reform. Well, even last week, Hamas was calling for Israel to be destroyed. There's no reform possible with radical Islamists, who find death to be their calling, and have never been interested in peace, on any terms. If the United Nations' members see fit to admit a terrorist organization to its ranks, then it has ceased to be a force for peace. They have been called the Gang of Four: Sharon Lexa Lamb, Derek Buntain, Ryan Bateman, and Fernando Mota Mendes. Operating from financial service firms in Grand Cayman, and taking orders from experienced Canadian investment advisers, in whose care the victims' cash and assets were entrusted, they used the assets to conduct unauthorized, and illegal, trades of securities, and investment of capital, keeping the profits for themselves, and laundering their illicit gains. In order to deceive, and mollify, the investors, they supplied a Canadian telephone number, (905) 481-1514, which was automatically forwarded to Grand Cayman, where Sharon Lexa Lamb would assure them that their money was safe, in a prominent international financial institution, though it was in Bateman & Company, Ltd. accounts, where it was used to conduct trades. The victims never knew that their money was gone, for they relied upon the misrepresentations of material facts of the fraudsters. Investors who demanded withdrawals from their accounts were stalled through implausible excuses, such as the bank's alleged need to learn the Source of Funds on the client's money, or clearance delays, all of which were bogus, and only designed to buy time, so that assets could be sold off, to pay the client's specific demands at that time. The clients' securities were held out by Bateman to be his own assets, and all stock dividends, and other income derived from client assets, was swiftly gobbled up by the Gang of Four. Records recovered have confirmed that there are no dividends, or other income, payable on the securities at this time, meaning that all income has been stripped out. As the investigation has developed, and expanded to Canada and the United States, the public disclosure of the central role of two prominent Canadian financial professionals becomes more likely, as criminal charges are anticipated shortly. The fate of the Gang of Four has apparently already been sealed by their actions, their arrogant denial of responsibility, and their subsequent attempts to obstruct justice; We shall promptly report the filing of criminal charges. 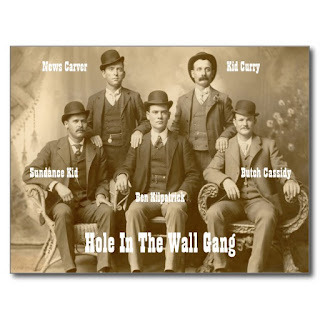 "Smash the Gang of Four"
The Fifth Circuit Court of Appeals has still not entered it ruling in the appeal, by master Ponzi schemer, R Allen Stanford, of his conviction and 1320 month (110-year) sentence. The last brief was filed back in March, but no decision has yet been filed. in July, the trial court denied Stanford's motion to release minutes of the Grand Jury that indicted him, and he is still bound by a gag order, which the Fifth Circuit denied having jurisdiction to consider, due to a lower court ruling, entered years ago. It does not appear that his points on appeal have sufficient merit to justify a reversal,and remand for a new trial; Stanford has been acting as his own attorney, but it is obvious that he is employing a cadre of "jailhouse lawyers" to assist him in the preparation of his appeal, as Stanford has no legal training, and the pleadings and briefs filed indicate that whoever prepared them has a nodding acquaintance with the Federal rules of Appellate Procedure. Many of Stanford's victims are awaiting the 5th Circuit ruling, which if it affirms the verdict and judgment, will put an end to his efforts to evade the long arm of justice. Many of his victims say that they have been left penniless, due to their investment in his phantom certificates of deposit. SHOULD YOU RAISE RISK LEVELS FOR GIBRALTAR ? 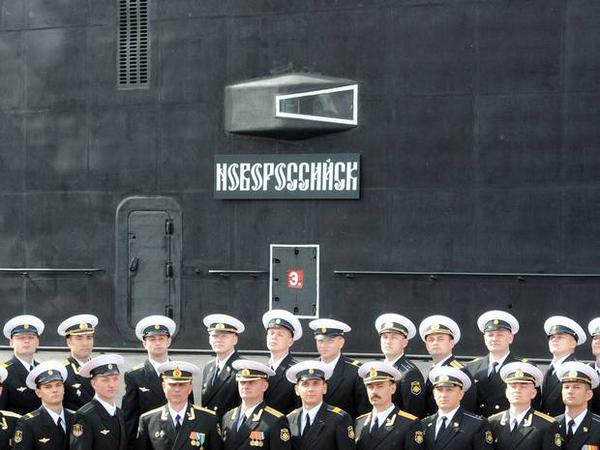 Spain, which continues to harass maritime commerce within Gibraltar's territorial waters, and recently reportedly fired warning shots at civilian vessels, has recently allowed a Russian submarine* to refuel and refit, at Ceuta, a Spanish enclave on the coast of Morocco. Spain is ratcheting up its campaign to take over the British territory, notwithstanding that the 1713 Treaty of Utrecht gave the UK sovereignty in perpetuity, and that Britain gave up other territorial claims at that time. Any nullification of that treaty would open a Pandora's Box of additional claims against Spain, and its leadership might want to open their history books once again, rather than making additional threats against Gibraltar; It is not Hong Kong. While Spain appears to have, as its policy, the aim of acquiring Gibraltar through peaceful means, increased pressure could take many forms, and the economy of the British Overseas Territory could be affected. It would be prudent, for Country Risk purposes, to monitor all future developments, regarding Spanish actions, if your bank, or any of its major clients, have ongoing financial exposure, or substantial commercial relationships with entities domiciled on Gibraltar. 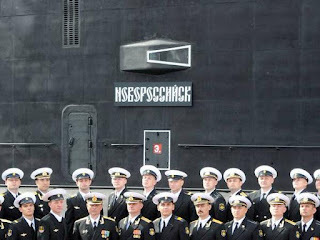 * That Russian submarine was reportedly en route to Russian-occupied Crimea, a fact that is not lost on those who must assess Country Risk on both the Ukraine and Russia. Individuals considering investing in the Republic of Panama are duly advised that REPUBLIC ASSET MANAGEMENT CORP., which is controlled by Ryan Bateman and Cody Bateman, both formerly of the Cayman Islands, is not licensed to provide fiduciary services in Panama, does not possess the required capital, and is a shell company with no assets. Republic has been warned previously, by Panamanian regulators, that it cannot operate as an asset management company, but it is still accepting investor funds. Investors who have entrusted funds to Republic Asset Management Corp. should immediately retain competent legal counsel, to seek to recover their assets, forthwith, if they still exist. Ryan Bateman, a Canadian national, is a fugitive from justice in Grand Cayman, for a crime of violence, and is currently under criminal investigation, as the former Managing Director of the Bateman Group*, a number of exempt companies, without a licensed manager, who reportedly diverted USD$450m in client funds, for a trading scam, where Bateman kept all the profits earned by improperly investing client money. Cody Bateman was a senior officer of the Bateman companies in the Caymans. 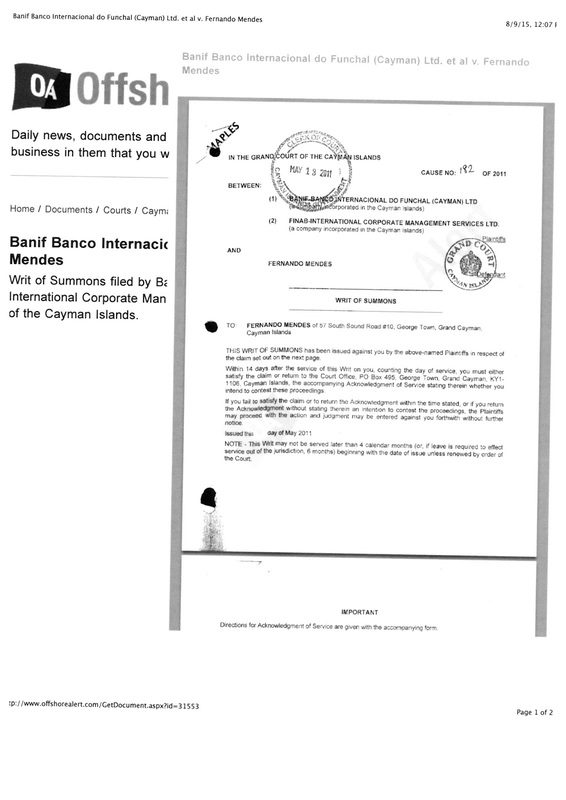 Bateman's known Cayman-based associates in the fraud include Sharon Lexa Lamb, Derek Buntain, and Fernando Moto Mendes; there were also a number of prominent Canadian investment advisers involved in the fraud, and subsequent money laundering, but their names will not be disclosed here at this time, to prevent them from flight to avoid prosecution in Canada. Bateman has another entity, Bateman & Company, Ltd., which traded client securities in the United States, without their consent & knowledge, through financial institutions in the United States. One wonders how the compliance departments of these US banks ever approved such transactions, given Bateman's dark past. 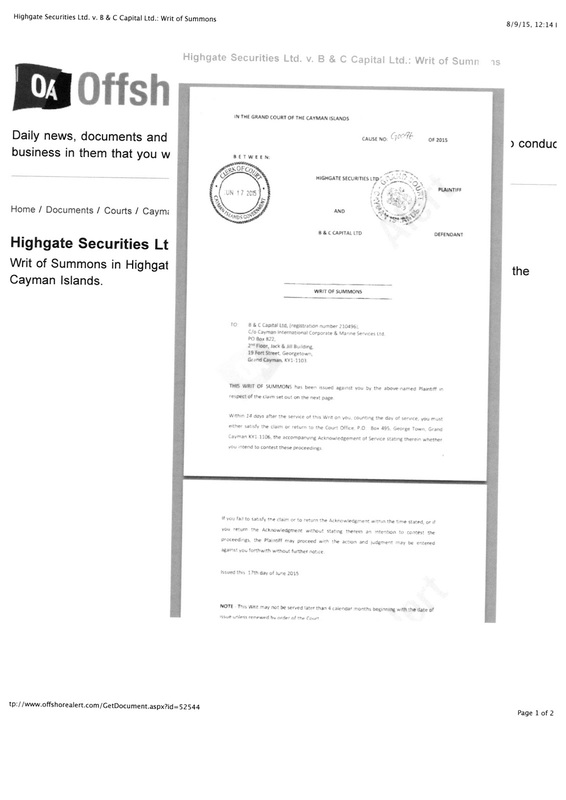 He operated bogus "High Yield Investment Programs (HYIP)" in Calgary, Alberta, until his activities came to the attention of government regulators, after which he relocated to Grand Cayman. * B & C Capital. Ltd.
WILL CARIBBEAN FRAUDSTER WHO DIVERTED INVESTOR WEALTH ESCAPE JUSTICE BY MOVING TO CUBA ? Sharon Lexa Lamb in Cuba. Law enforcement agencies in the United States estimate that there may be as many as one hundred and twenty-five Westerners, who are fugitives from justice, residing in the Republic of Cuba, where they are immune from extradition, so long as they do not commit new crimes there. 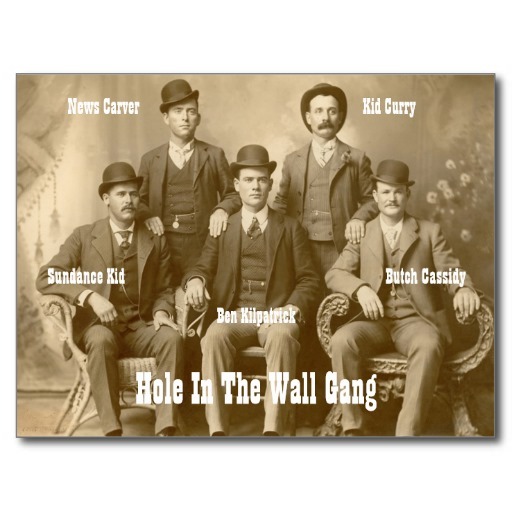 Sometimes, they have ben referred to as the "Hole-in-the-Wall Gang," due to a similar relocation tactic, employed by two celebrated outlaws*. Sharon Lexa Lamb, who reportedly is a key participant in the Bateman Capital trading scandal, and faces possible criminal prosecution for money laundering, grand theft, and fraud, may soon be one of them. Miss Lamb recently married the Cuban national, José Fernandez Santana, which affords her the right to reside in Castro's Cuba. Reliable sources, with first-hand knowledge of the relationship, have pointed out that her marriage was strictly one of convenience, made solely for business purposes. It affords Ms. Lamb the prized ability to purchase Cuban real estate, and make other investments there. She has been a regular visitor to Cuba this year. Investigators fear that Lamb, together with her associates, Derek Buntain, and Fernando Moto Mendes, have transferred liquid assets of some of Canadian & American investors into Cuba, without their knowledge & consent, and made purchases there. Should the assets of any US citizens, or residents, be found to have been used to make investments inside Cuba, there will be serious OFAC violations, which could result in multi-million dollar civil fines and penalties, and even possible criminal prosecution, in the United States. It could also result in the permanent imposition of OFAC sanctions. 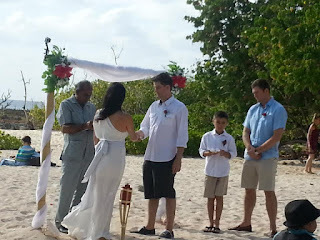 Reports from Grand Cayman indicated that Sharon Lamb traveled to Cuba, when the initial flap over the Bateman scandal broke recently; was she laying the groundwork for relocating permanently to Cuba ? We cannot say, but we will be closely monitoring the progress of all of the criminal investigations, and any civil litigation that is brought by the victims. Ignacio Fabrega, the former Panamanian Superintendent of Securities, who disappeared while out on bond for criminal charges, has been taken into custody. Fabrega dropped out of sight five months ago, after a judge agreed to conditions of release, a decision which was immediately appealed by prosecutors, and reversed, but by then the former official could not be found. Fabrega has reportedly admitted that it was he who improperly gave inside information to Financial Pacific (FP), the investment company which orchestrated the multi-million dollar insider trading scandal, whereby many government ministers, and then-President Ricardo Martinelli, reaped huge profits, by trading in the securities of Petaquilla Gold Mine, based upon confidential information about the company. The defendant also admitted killing the subsequent investigation into improprieties and illegal conduct, by FP, following the instructions Martinelli, and former Minister of Tourism, Salomon Shamah. It is common knowledge that Fabrega received large bribes, to quietly dismiss investigations into securities fraud, insider trading, the illicit sale of bogus securities to investors, and many other financial crimes. under his watch, enforcement of Panamanian securities law ground to a halt, but his close relationship with Ricardo Martinelli protected him, so long as Martinelli was in office. The Financial Crimes Enforcement Network (FinCEN) has again proposed requiring investment advisers to comply with AML regulations, including the filing of CTRs, and Suspicious Activity Reports. If you have not already seen the complete text of the proposal, you may access it here*. Will it change the way hedge funds conduct business ? If you have been closely following our articles covering the unfolding Caribbean financial scandal, involving the illegal diversion of funds of as many as seventy retired and handicapped Canadian senior citizens, for the purpose of using client money to conduct unauthorized trades, and keep the profits, the entire scheme was orchestrated and run by a major Canadian investment firm, located in Ontario. The illegal diversion of client money, by Fernando Moto Mendes, Sharon Lexa Lamb, Ryan Bateman, and Derek Buntain, was accomplished under the supervision of the Canadian investment advisers entrusted with safeguarding their clients' life savings. Some estimates of the total amount of client funds missing exceed USD$400m. Only a portion was transferred to Bateman Capital; some funds were diverted elsewhere. Investigators have now confirmed that the offshore financial institution where the Canadian advisers, and their Caribbean conspirators, have long stated that client funds were on deposit, have no records that the clients ever had any funds in that bank, notwithstanding that verbal and written assurances were given to the clients. Numerous complaints, from Canadian investors who are unable to access their funds, have been received by regulators in the Caribbean jurisdiction where a large portion of the money disappeared. While we are not identifying the Canadian investment firm at this time, some of its staff and officers were formerly employed at a prominent financial services company, and were reportedly asked to leave, after being implicated in a stock manipulation scheme. The matter was investigated by the Ontario Securities Commission, but the company declined to press criminal charges. That was a mistake, for some of the departing employees improperly used inside information, regarding confidential information concerning the company's future acquisition. We will be identifying those individuals, and detailing their respective roles, when certain additional information becomes public record; One individual is retired, but all the others are active investment advisers. The Canadian company is refusing to release any financial information to those clients who believe that they have been defrauded, their assets dissipated, and illegal covert profits taken with their money. It has, however, disclosed that it has engaged in what may be considered as illegal trades in securities, using their funds, again totally without client permission, authorization and knowledge. Documents were allegedly altered, client signatures forged, and records destroyed, all to cover up the trading fraud. It is believed that the company's present dilatory tactics are being conducted solely to allow it sufficient time to sell off assets, to find money with which to repay its investors, as client funds were reportedly completely co-mingled with other capital. The civil, and criminal, liability of the company, and its officers, directors, staff members and employees, will certainly be a question for Canadian courts, and courts in other jurisdictions, as more details of the scandal emerge. We shall be covering the legal proceedings in detail, commencing tomorrow, when they become public. 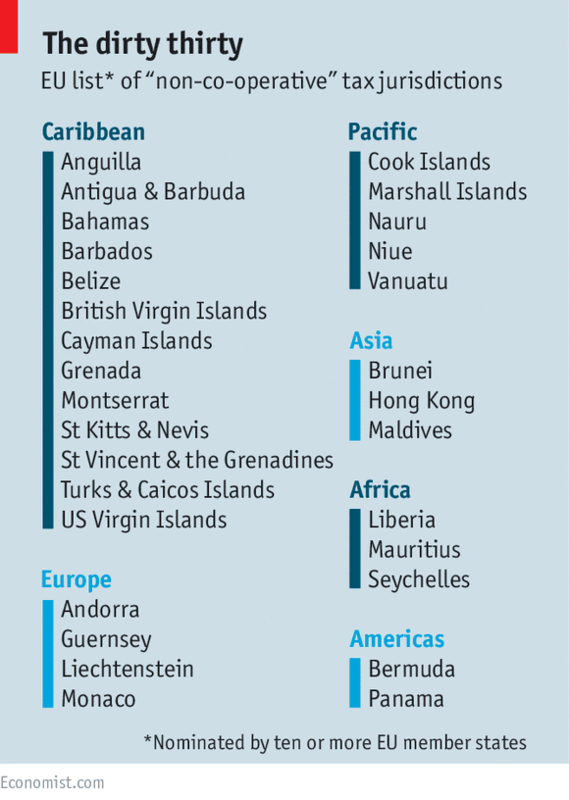 The Economist recently published an article critical of how the EU decides which is a tax haven jurisdiction, and which is not to be so designated. You might want to retain a copy (see illustration above) for your junior compliance officers to place upon their desk, for ready reference, when deciding whether to conduct due diligence, or enhanced due diligence investigations, at account opening. The areas in western Venezuela, near the frontier with Colombia, which have been placed under martial law by President Maduro, have been instructed to restrict the entry and exit of the Bolivar from that region. Constitutional rights have already been suspended in that area, and compliance officers whose foreign financial institutions have exposure in that area should immediately recalculate Country Risk for Venezuela, in light of this new prohibition on repatriating liquid assets from the affected area. Please note that the unofficial exchange rate, between the Bolivar and the US Dollar, has passed the 700 level; It currently stands at 727-to-1USD. A Panama attorney has asserted that one of the Anti-Corruption Prosecutors, Zuleika Moore, was the incorporator and subscriber of a corporation linked to the convicted Colombian Ponzi schemer, David Eduardo Helmut Murcia Guzmán, who was convicted of money laundering in the United States. Prosecutor Moore has been accused of forming a company known as Companie De Eonseil Et D, which is known to be controlled by Murcia. The allegations are that the corporation was part of Murcia's network of corporations and private foundations, all connected to the scandal involving money laundering at the Private Bank of Andorra (Banca Privada D'Andorra). There have been calls for an investigation in Panama City, which could result in her dismissal. 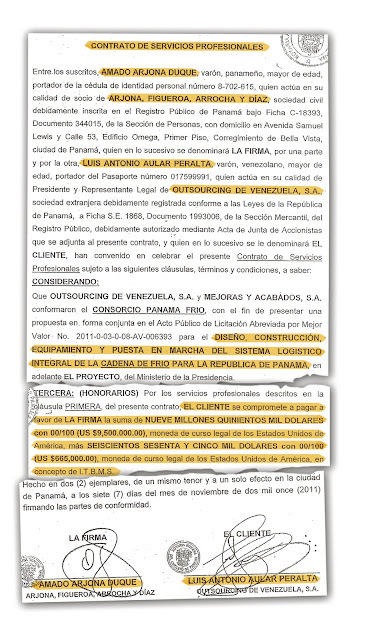 Anti-Corruption Prosecutors in the Republic of Panama routinely handle money laundering cases. The $400m scandal involving Bateman Capital and its principals, the fugitive MD, Ryan Bateman, and Fernando Moto Mendes his successor MD, who ran a scam through which Bateman covertly traded funds of over sixty Canadian & American investors, who thought their money was safe in a financial institution, continues to be under criminal investigation in at least three jurisdictions, including the United States and Canada. We have detailed the colorful backgrounds of the Bateman brothers, and Moto Mendez, in previous articles appearing here on this blog*. The Batemans, including Ryan, are now believed to living in Panama City, Republic of Panama. The most visible figure in the scam appears to be Sharon Lexa Lamb, Senior Vice President in both Dundee Merchant Bank, and Dundee Leeds Management Services, Ltd., who was instrumental in facilitating the illicit, and unauthorized, movement of investor capital to Bateman Financial, where it was deposited into an account under Ryan Bateman's control. Bateman then conducted securities trades with the money, and he & his co-conspirators took all the profits for themselves; Lamb has admitted her involvement to witnesses, and has allegedly asked for immunity from prosecution, which will reportedly not be granted, given the circumstances; Lamb is the primary contact with Ryan Bateman. Lamb, who was the direct liaison with the investors, and who made material misrepresentations of fact to them, in response to their inquiries, participated in the scheme, by deceiving the clients, all of whom trusted her, due to her former position at Dundee Bank. The role of her paramour, the Cuban national, José Fernandez Santana, has not yet been established, but it is under investigation. Fernandez Santana operates a 60' yacht, which regularly travels between the Republic of Cuba, and Grand Cayman, for no apparent reason, and questions have arisen as to whether he is engaged in bulk cash smuggling and money laundering; We invite Sr. Fernandez to respond, on the record. An additional player in the scandal is the convicted American money launderer, and ex-Bateman Capital principal, Joshua VanDyk. Much of Van Dyk's court file is sealed, indicating that he may be a cooperating individual, assisting American law enforcement agencies. The fact he is not presently serving any of his 30-month prison sentence in custody, but in a halfway house, is indicative of a major arrangement between VanDyk and law enforcement. VanDyk moved what he believed to be dirty money to the Turks & Caicos Islands, prior to its transfer to Cayman. Was José Fernandez Santana involved in bulk cash smuggling for VanDyk and/or Bateman ? We cannot say, but Fernandez has a key role in the Bateman matter, and it will come out. The fraudsters misrepresented, in writing, that Bateman's shell company, B & C Capital, was a financial institution, and that Sharon Lexa Lamb was the servicing agent, through a company controlled by Derek Buntain, also a former officer at Dundee Merchant Bank. Investors, who placed their money through a Canadian financial services firm, assert that their signatures, and initials, have been forged, and documents fraudulently altered. Buntain is also said to be one of the conspirators in the scheme. Lamb has threatened legal action, should she be named in any articles appearing in this blog, and has arrogantly attempted to extort my silence, by threatening to interfere with the transfer, and return, of investor money, should her name appear here. We do not respond well to threats on this blog, and will continue to expose all the players, as additional facts become known, including the names of all banks involved, and corporate entities outside of the Caribbean, who had a role in the trading scheme. Reports from anonymous professional sources in the United States assert that Arab Bank, the defendant in a landmark terrorist financing case, brought by American victims of Hamas' attacks, has agreed to settle the case for an amount that exceeds one billion ($1,000,000,000) US Dollars. A spokesman for the Arab Bank stated that this settlement amount, which is confidential, is "inaccurate." Lawyers for the more than 500 plaintiffs said to be participating in the settlement have said that details of the settlement will be worked out during the coming months. The case was set to go to trial next Monday; a verdict on liability was reached last year, and the potentially massive reputation damage that would have occurred during this upcoming trial, where photographs of the plaintiffs' injuries were anticipated to be shown in court, may have be the determining factor for the bank, in settling the case. The bank was found to have forwarded payments to the next of kin of suicide bombers who injured or killed US citizens in the Middle East, a violation of American counter-terrorism laws. The US Attorney's Office in Manhattan has filed its Memorandum of Law in Opposition to Defendant's Motion for a New Trial based upon Newly-Discovered Evidence, in Viktor's Bout's arms trafficking case. His "dream team" of attorneys have a difficult task, for the existing case law imposes a very high burden upon anyone seeking a new trial. "It is well settled that motions for a new trial are not favored;" they are generally granted " with great caution, and in the most extraordinary circumstances," as the Government's memorandum correctly states. (1) Government witness Andrew Smulian was a confidential informant throughout the matter, and therefore could not have conspired with Bout. (2) The Court's opinion, which withdrew its adverse credibility findings, was improper. 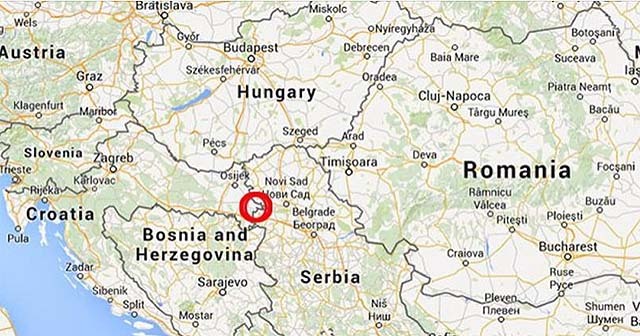 (3) The declaration of a Bulgarian arms dealer would have changed the outcome of the trial. (A) The purportedly newly-discovered evidence fails to establish that Smulian was a Government agent. (B) Bout's post-arrest statements were not presented to the Grand Jury, and did not figure in its decision to indict him. (C) The declaration of the arms dealer was neither newly-discovered evidence, nor an adequate basis for a new trial. The denial of Bout's motion should, for all intents and purposes, end his quest to have his case tried for a second time. We shall continue to follow this case, as it is of great public interest. The Russian Government continues to insist that it was purely a political prosecution, and some observers question whether Bout was targeted due to his falling out with segments of the American intelligence community, with whom he had a long, but covert, relationship. 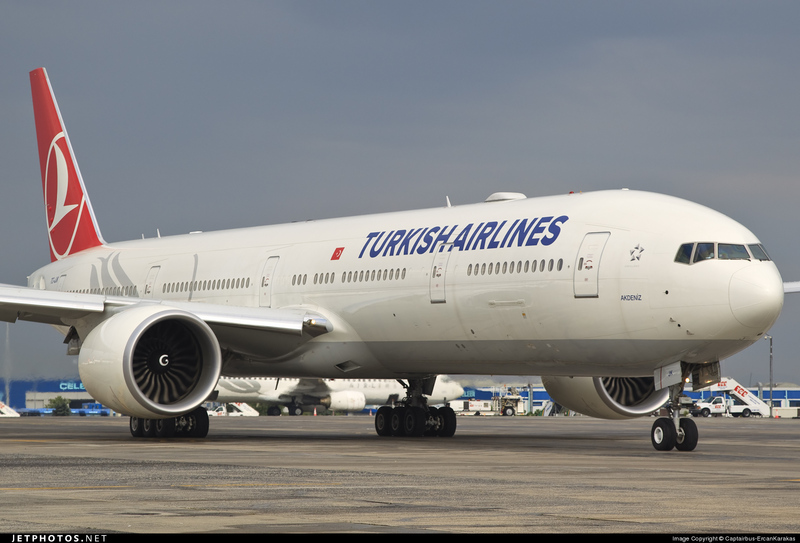 Turkish Airlines, which offers only minimal service to Latin America, and no flights to Central America, has announced that it will fly nonstop to Panama, thrice weekly, commencing in February. Turkey and Panama have no international trade to speak of, so why, of the 28 countries not served by the airline, is Turkish expanding Panama ? This new service, said to anticipate employing Boeing B-777-300ER extended range airliners, will have serious implications in the area of terrorist financing. Turkey has become the international headquarters, and safe haven, for Hamas, the Specially Designated Global Terrorist (SDGT) organization, which located its operations to Istanbul, with the blessing of the country's president, who supports Hamas. In truth and in fact, the Hamas leader resident in Turkey, a terrorist with blood on his hands, and a dark past, is actively conducting Hamas operations in the West Bank (Judea & Samaria) against Israel, and Turkey shows signs that it is actually supporting Hamas. Hamas will soon be able to move bulk cash, financial instruments, gold & precious gems, and even weapons and ammunition, from its financiers residing in Panama City, nonstop into Turkey. Panama's corrupt government officials will do little to monitor the cargo upon outbound flights to Turkey, and will probably even assist in illicit export, assuming that the usual bribes are paid to them. This news, coming on the heels that Emirates Airlines has also announced new service from the Middle East, nonstop to Panama, means that financial service professionals assisting known terrorist groups, will now have a variety of ways to repatriate narco-profits, and to further facilitate funding themselves. 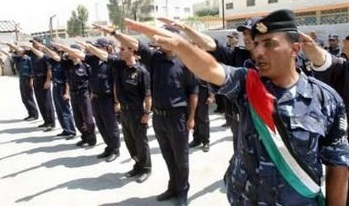 Remember that Turkey's nationalist president recently called upon Muslims in the region to march on Jerusalem. He will not control Hamas, but assist it in its terrorist operations. Do not look for the US and Canada to respond to this new terrorist financing challenge, for they employ their assets in Panama as a valuable listening post on Latin America, and do not want to damage their ability to do so, by rocking the boat. This means that bankers in the Western Hemisphere must now accept the fact that money movement into Panama, through their financial institutions, now has an even greater chance of being used to purchase AK-47s for Hamas than before. 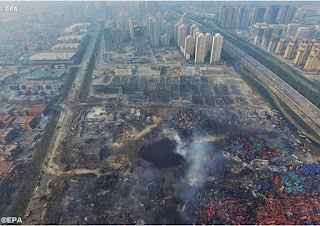 The two Chinese executives who were responsible for the warehouse disaster in Tianjin have been detailed by the authorities. Both are PEPs, one the son of the former local police chief, and other a former executive at a state-owned chemical company. They used their political connections to improperly obtain a license to operate a plant containing toxic chemicals, when it was illegal to have one so close to residential areas. The latest toll is 114 dead, and 674 injured, with more than 117,000 homes damages or destroyed. Their method; disguise their corporate ownership. One PEP used his cousin to hold his stock, and the other employed a former school classmate for that purpose. Unless and until China puts a stop to this, compliance officers in Western banks must discount all shareholder information originating in China, when conducting due diligence, and enhanced due diligence, investigations, for customer identification programs. Frankly, you should regard ALL Chinese corporations as being owned by PEPs, until the client can conclusively prove otherwise; Yes, it is that bad. Amado Arjona Duque, the attorney named recently as a central player in what is described as a ten million dollar extortion, perpetrated upon a businessmen who wanted a lucrative government contract in the PAN scandal, is no stranger to controversy. 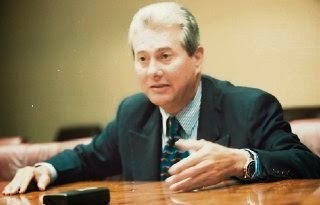 Amado was linked to the convicted colombian billion dollar Ponzi schemer, David Helmut Eduardo Murcia Guzmán. 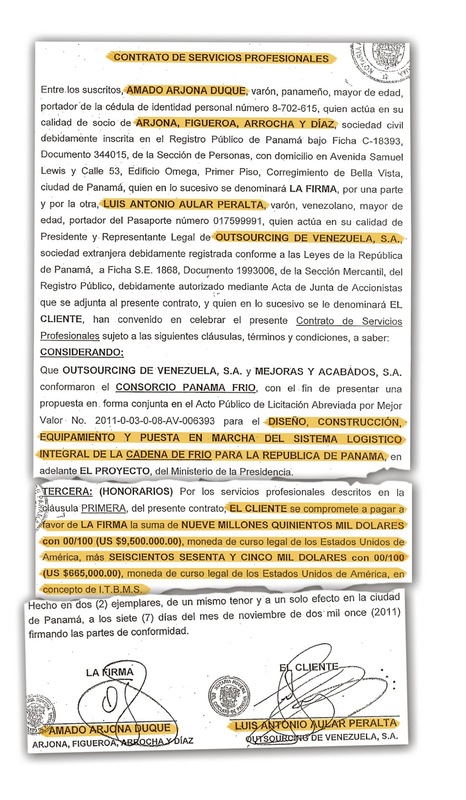 Allegations that attorney Amado was involved in the "commission" for "professional services,' on behalf of his client, who allegedly was acting for the recipient of the kickback, Panamanian President Ricardo Martinelli, who employed the intermediary, seem to be verified by reference to the agreement, which appears below. The questions remain: if Amado was a known associate of Murcia, whose fraud had al;ready been exposed, why didn't anyone object to his role in the PAN matter ? And what exactly did Amado do for Murcia ? Should Colombia, or the US, have charged Amado in their cases against Murcia ? If you are following the nightmare in a northern Chinese port, where an explosion in a dangerous goods warehouse caused extensive damage, and loss of life, you should know that the Chinese leadership immediately started protecting its own in this scandal. Transparency has never been a strong suit in China, but this is unacceptable conduct. The local database, which would have identified the officers and ownership of the corporation that holds the warehouse, mysteriously went offline for several days, according to reports from the region. When it came back up, there were curious gaps in the information. if you wanted to know why, remember that Chinese PEPs often use front men to hold title to their possessions, to disguise the fact that they acquired their wealth assets through political connections, and not through hard work. In this case, apparently the front man was acting on behalf of a "princeling." the son of a local official, who truly owns the cyanide-laden warehouse, which was granted a permit, notwithstanding that residential structures had already been approved in the immediate area. The front man involved has already admitted that he was holding the corporate stock for another, whom he declined to name. Given this level of official subterfuge and opacity, operating to protect their own power structure, and its corrupt nature, how can anyone ever expect to get the truth in data out of China ? No wonder Country Risk levels for China do not decline, as the country's economy expands, but actually increases, due to corruption, and preferential treatment for China's kleptocracy. 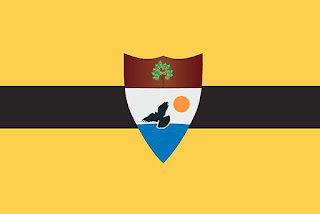 The Free Republic of Liberland, the creation of a Czech national, theoretically exists in a small, uninhabited, and disputed, piece of territory on the Danube, lying between Serbia and Croatia. Considering that a large number of individuals have already sent in applications for citizenship, expect that some enterprising money launderer, or adviser to narco-traffickers, will soon have a passport from that micro-state, which is actually not a state at all. Should you encounter clients presenting any forms of identification asserting that that they are from the Free Republic of Liberland, know that it has not been recognized by any country, and is a non-entity for customer identification purposes. You might want to alert the members of your compliance team to tell those New Accounts people at your bank (the ones who were not paying attention in Geography class) not to accept them at account opening. WILL CHINESE AGENTS EXPOSE THE CORRUPT PEP WHO IS ONE OF YOUR BANK CUSTOMERS ? The United States Government has reportedly warned China that its undercover agents are not welcome in America. China, which has been seeking the return of a large number of its nationals, wanted for corruption, money laundering, criminal activity, and the possession of sensitive information, many of whom have sought refuge in the United States. There are Federal criminal penalties for anyone who is an Unregistered Agent of a foreign nation. Some of the Chinese agents have physically threatened those who fled China for America, or have stated that their relatives will be harmed or imprisoned, if they fail to return to China voluntarily. The United States and China have no extradition treaty, but there is some level of cooperation; China reportedly wants forty high-profile fugitives living in America. How is this relevant to you, as a compliance officer at an international bank ? if your management has overruled your recommendations, and accepted high net-worth Chinese emigres as clients, you may have a well-heeled fugitive on your hands. If intelligence agents from China, tracking a target, find him in your city, and banking with you, the resultant publicity generated when media cover the story may not be the way in which you wish your bank to be portrayed. You are banking a corrupt Chinese PEP, or career criminal, they say ? Not good for your bank's image. It is prudent for your compliance staff to revisit any bank clients who could possibly be wanted by the Chinese government; they will have sizable accounts, not be engaged in any occupation, and possibly be former Politically Exposed Persons (PEPs) in China. You do not want to be identified as the American bank of a Chinese criminal in the press. SHOULD COMPLIANCE OFFICERS AVOID LOADING WINDOWS 10 ON THEIR COMPUTERS ? The publicity surrounding computer bugs aside, some computer experts are warning the public that Windows Ten has undisclosed issues, and compliance officers should be aware that they could jeopardize the effectiveness of the AML/CFT software installed on their computer systems. These are potential problems, and since it is not known whether they will interfere with your ability to conduct customer identification procedures, is it not better to totally avoid Windows 10 ? (1) Microsoft can remotely disable what are described loosely as pirated programs, or counterfeit software, running on your computer. What is your software providers gives your software that fits either of these categories, and Microsoft disables it ? Will it also affect your AML software ? (2) The ambiguous language says MS can also disable your hardware, if software is deemed to be counterfeit. Will it result in your loss of your computer ? (3) There will be NO notices or warnings provided, before Microsoft automatically downloads updates to your software. You will have no ability to reject it, and you will not know that it even happened. Your IT people will tell you that it is possible that updates could possibly damage your other programs, including your anti-money laundering software. Don't you want the option to install or not to install ? These issues I consider unacceptable for compliance officers, who have a number of programs related to AML compliance on their systems. What if Microsoft's actions ruin or interfere with their operation, or Microsoft disables all or part of your computer ? In my humble opinion, avoid downloading Windows 10, until these issues are resolved. NEW NONSTOP FLIGHT, FROM PANAMA-TO-DUBAI: TERRORIST FINANCIERS' DREAM ? Emirates Airlines has announced that, commencing in early 2016, it will offer service between Dubai, UAE, and the Republic of Panama, a seventeen and one-half hour flight that will become the world's longest nonstop journey, a total of over 13,800 km. The airlines will operate a Boeing B777-200LR extended range on the route. Financiers for Hezbollah and a number of other sanctioned Middle East terrorist groups, must be jumping up & down for joy, for their jobs will become much easier. The amount of international trade between Panama and the Middle East is nominal, but the nonstop flights will greatly facilitate both illicit ( i.e. money laundering) transactions, and terrorist financing operations. Hezbollah, Hamas, and many other specially designated global terrorist organizations raise funds, through drug trafficking and other illegal activities, which are laundered and moved into, and through Panama. Bulk cash smuggling, via business jet, from Venezuela, into Panamanian general aviation airports, is the most common method of transport. The cash is readily accepted in the vast majority of Panama's banks, who seldom, if ever, check Source of Funds, and beneficial ownership, and turned into cashiers' checks, or other monetary instruments. Now, with an easy method of moving these financial instruments, by carrying them on board an Emirates flight to Dubai, and immediate deposit into local banks, or transshipment to Lebanon, terrorist financing is facilitated. The reverse, nonstop travel from Dubai to Panama, will allow terrorist financiers to enter Latin America without the necessity of transiting Europe, or North America, where their identities could be recorded. Given the widespread corruption that pervades Panama, it is doubtful that either arriving, or departing, passengers on Emirates will be monitored, or their baggage examined, in Panama. I imagine that money managers for Hezbollah will be regulars on those flights. Attorneys for the plaintiffs have announced that a pretrial settlement has been accomplished in the landmark terrorist financing case against Arab Bank in US District Court in New York. The plaintiffs, who were Americans injured in terrorist bombings in Israel, and the next of kin of those who died in those attacks, had previously prevailed on liability issues, and a trial on damages was to begin jury selection on Monday. Terrorism cases provide for treble damages, under American law. The case took a decade to go to trial, and the bank's unsuccessful dilatory litigation tactics were an abject lesson in what not to do, if your bank is faced with a similar situation, for the net result was to alienate the Court, and to compound the bank's reputation damage, both with the American public, as well as the international financial community. Lawyers observing these proceedings also took away strong feelings about the lack of ethics of the conduct of the bank, and its counsel. Whether the bank will ever recover from the damage inflicted by this case is unknown. The impact of the settlement, the terms of which have not yet been disclosed, and which the attorneys stated would be finalized during the coming weeks, cannot be underestimated. Arab Bank paid the families of deceased suicide bombers a stipend, after their fatal attacks, and international banks who wish not to be in a similar situation in court will have to insure, through their compliance process, that they have absolutely no role in terrorist financing, or in providing materials support to terrorist organizations, lest they end up with multi-million dollar judgments, and massive reputation damage. 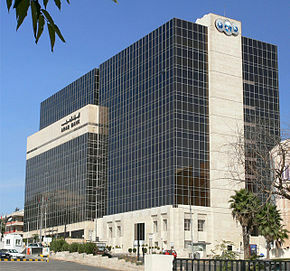 Arab Bank headquarters in Amman. IS YOUR COMPLIANCE DATA FROM CHINA BOGUS ? The disturbing news from China today, to the effect that some enterprising soul had opened a totally bogus, and unauthorized, branch of China Construction Bank, and trusting individuals had deposited their savings into it, only to learn later that they could not make withdrawals from genuine branches of CCB, merely illustrates the nature of a country where counterfeit hermes Birkin handbags are turned out, and exported abroad, and the counterfeiters allowed to operate with impunity. We've all heard the stories of the bogus Apple store that opened in China, or the Ikea "store" carrying only locally made furniture. Such events should make all compliance officers at international banks, whose clientele includes affluent mainland Chinese, to accept, but verify, every piece of identification and due diligence material that you receive on your customers. Is he truly a wealthy factory owner, or really a general officer who is diverting military purchasing funds to his own use ? Is she a professional, or just a corrupt PEP, whose father is a government official sending her money to pay bogus invoices disguised as services rendered by her firm, but which, in truth and in fact, are phantom billings ? 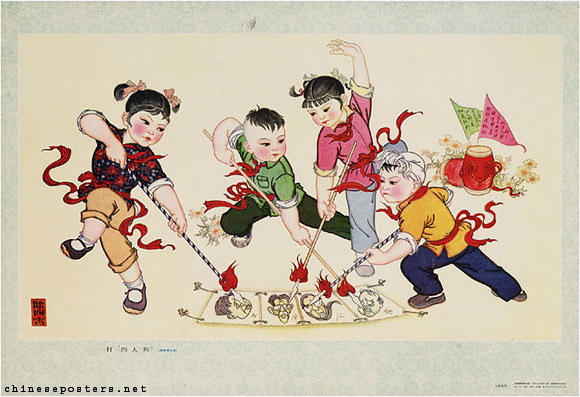 In short, given the propensity for Chinese criminals to knock off legitimate global brands, and the country's PEPs to steal billions each year, of government funds, and to accept bribes & kickbacks, all due diligence, and enhanced due diligence information, that you collect on Chinese nationals must be independently verified, through trusted ( not local Chinese) sources. To do anything less is to be banking criminal proceeds. Remember well that China is today looking to arrest some 10,000 of its nationals, who have taken the money, and run off to the United States, with dirty money. Don't bank any dirty Chinese PEPs, or career criminals operating in China. Documents leaked to the press this week have once again reinforced the general conclusion that Western banks simply cannot accept any Palestinian PEPs as clients, because the Palestinian Authority leadership allows rampant corruption to flourish, in order to receive sorely needed political support from its corrupt rank-and-file officials. The diversion of public funds, and the theft of money budgeted to help the people of the Palestinian territories, continues unabated and unchecked. In the first case, former PA Deputy Foreign Minister, Majdi al-Khalidi, who is currently the principal diplomatic adviser to the President of the Palestinian Authority, signed and delivered a letter to the Government of Bahrain, specifically that country's foreign minister, asking for $4m in donations. The ostensible purpose for the request was for funds to build a complex in Ramallah, whose aim was to "resist Israeli settlements. 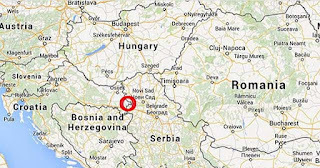 "The problem is that there are no such settlements in the area. Why ask for money to combat a non-existent threat ? So that it can be diverted, and flow into the pockets of corrupt PEPs. In the second case, Nazmi Muhanna, who is the Director General of the Palestinian Crossing and Borders Authority, asked the PA for $15,000, of which approximately $10,000 was to pay for his daughter's private school tuition in Jordan, and the balance to cover his family's Jordanian medical expenses. The best compliance approach is to reject all Palestinian PEPs as account holders, for the number of PEPs that are not corrupt would fit on the head of the proverbial pin. 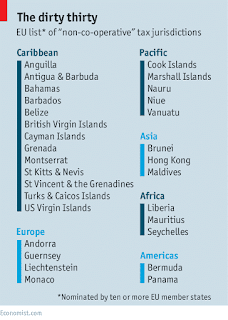 ARE WE TO RAISE COUNTRY RISK ON THE CAYMAN ISLANDS ? If you have been reading this blog lately, you know that I have been extensively covering a major financial scandal unfolding in the Cayman Islands. There are allegations of illegal co-mingling of investor account with those of financial advisers, of unqualified and unlicensed financial services companies engaging in securities trading, of financial advisers with dodgy backgrounds illegally using client money to trade for their own accounts, and of the forging of client signatures, and the alteration of documents, among other crimes. 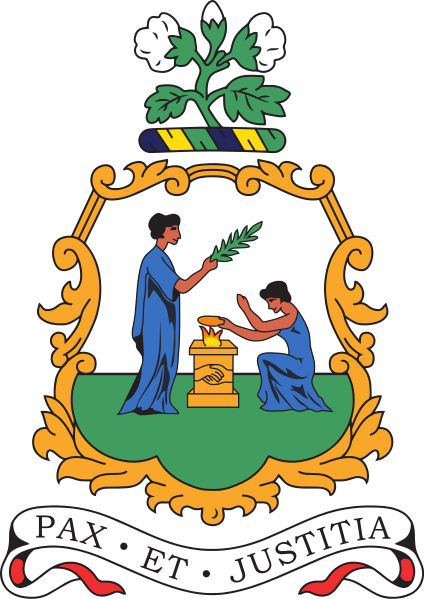 The case will be a test of the current ability, and inclination, of Cayman law enforcement agencies, and regulators, to enforce the laws and regulations governing financial services.While there is sufficient law on the books to protect investors, whether it will be enforced in this specific case, meaning in both its criminal and civil aspects, will be a good indicator of how financial professionals outside of the Caymans should evaluate County Risk. If justice is done, you can be assured that the system works as it was designed to do, and therefore the risks of doing business are within normal parameters, meaning that they are minimal However, if investors lose their money, and their securities cannot be recovered, we will have to reconsider the safety of investments, or financial transactions in general, with financial service firms located in the Cayman Islands. All the individuals who worked at the Bateman companies; Bateman Financial, Ltd., Bateman & Company, ltd., and B & C Capital Ltd., have left Grand Cayman, some more abruptly than others. Let's take a look at each of them. 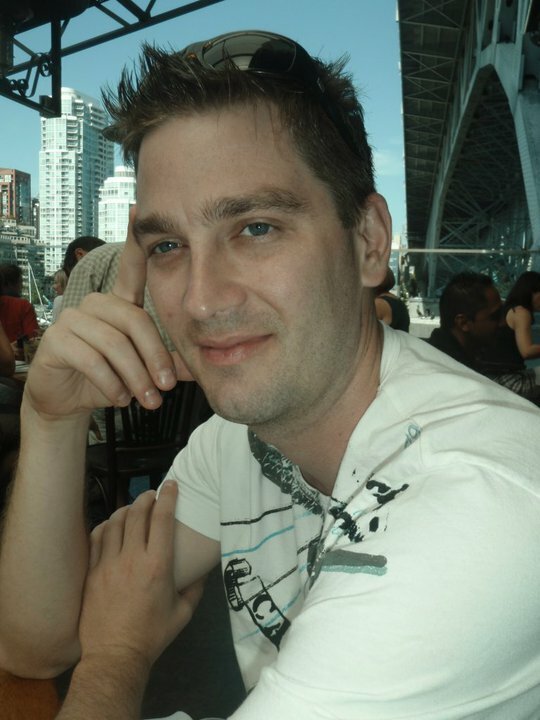 (1) JOSHUA VANDYK: Convicted of Conspiracy to Commit Money Laundering, and sentenced to thirty months' incarceration by a United States District Judge in Virginia. A review of VanDyk's case file shows that he was engaged in the marketing & soliciting of US citizens to use VanDyk's services to hide assets, including criminal proceeds from the US Government, including the IRS. He did this during the time that he was on staff at Bateman Capital, which was referred to in court documents as "Corporation B. "Considering that several of the filings in VanDyk's case* are sealed, the Bateman firm may be under investigation by American law enforcement agencies. 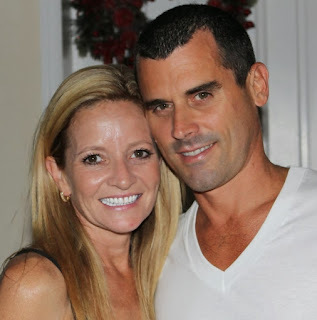 (2) RYAN BATEMAN: A fugitive from justice, Bateman, while out on bond from a charge of Inflicting Grievous Bodily Harm upon a Female, failed to return to Grand Cayman, to face the music. A large number of victims have asserted that he failed to segregate client funds, and actually engaged in trading with client money, without their permission and consent. He reportedly received investor funds from Dundee Merchant Bank, and allowed investors to believe that B & C Capital was a licensed and chartered financial institution, when in truth and in fact, it was a shell company, with no assets. He also formed a company, designated B & C Capital Ltd., in the United Kingdom, which was struck off and dissolved. Was the UK company designed to lure investors in ? (3) CODY BATEMAN: The brother of Ryan, and the Executive Vice President at the Bateman companies. He has now moved to the Republic of Panama, where he and his brother own and operate an unlicensed shell company called Republic Asset Management Corp., which has been cited by regulators, because it holds no license or permit to hold client wealth, a violation of Panamanian law. (4) FERNANDO MOTO MENDES: The successor MD of Bateman Capital, after Ryan Bateman's unlawful flight to avoid prosecution. He has fled to Jamaica, where he has been reportedly seen in the company of his estranged wife. A former bankrupt, with prior criminal charges, and civil cases, he is ineligible to act as managing director of any Cayman company with fiduciary responsibilities. He often uses the alias, Fernando Mendes, to avoid having his past exposed to investors. Which of these individuals has stolen investor money, and fled the Cayman Islands ? Perhaps it is high time that Cayman authorities find out how much is missing, and who took it. I know that, in the Caymans, people tend to keep a lid upon financial crime news, lest the negative publicity deter future investors, but the genie is already out of the bottle. *United States vs. Vandyk, Case No. : 14-cr-00082 (ED VA).